An accident threatened to permanently sideline Nick Scott. He’d have none of that. He fought against the pain and frustration and walked up to receive his college diploma. Bodybuilders are transformation experts. They shape their frames into remarkable specimens. Some start lean and build slabs of muscle. Others begin as behemoths and carve fat to reveal muscular underbellies. Some bodybuilders, like Nick Scott, transform to save their own lives. Nick didn't have bad habits. He wasn't obese or unhealthy. His life changed instantly when his car blew a tire and rolled, damaging his spine. For the past 14 years, Nick has battled through rehabilitation and pain, weight gain, and eventually, determined change. At big events, Nick rises from his chair to stand on his weakened legs, then takes swinging steps across the stage to inspire audiences worldwide. Triumphant fists punctuate his redemption. He didn't let the accident destroy him. Nick used it to establish a new identity and build a stronger body. This is his story. "Back in August of 1998, I was 16 years old. I was going to football practice and my left front tire blew out. It rolled my vehicle five-and-a-half times. It broke my back and damaged my spine at T-12 (Thoracic/chest) and L-1 (Lumbar/lower). The doctors diagnosed me as paraplegic. They told me I would never walk again. My football days were over. I was devastated. I got severely depressed. My weight went up to 300 pounds and I basically wished the accident would have taken my life. Nick Scott knows supplements won't replace a solid diet, but he uses them to maximize his results. Check out his supplement regimen! Nick Scott eats consistently clean to fuel his stage-ready physique. Check out his nutritional regimen to learn how The Beast feeds his body. You said you went through depression before the gym pulled you through. Can you explain how those negative thoughts affected you, and how you reversed them? Nick: Those negative thoughts affected me in every aspect of my life. From living life, relationships, the gym, and everything I did. It felt like I was starting life over as a new person, but as an infant, because I could barely move with my chest brace on. After my accident I got extremely depressed. At times, I wished the accident would have taken my life. Even going back to high school was torture. I was 16 years old, a junior in high school, and seeing everybody do what I couldn't do anymore killed me inside. I thought the weight room would be my savior because it is what I love, but I was wrong. Going back to the gym discouraged me that much more. To see everybody do what I couldn't made me feel worthless. But I realized I could still bench press. Something inside snapped. I told myself if I couldn't do anything, the one thing I could be was stronger than everybody, and that's what I did. Bench pressing gave me something to focus on; it was my outlet, the only thing I felt I had left. It was precious to me, close to my heart and I became obsessed with the bench press more than anybody else. 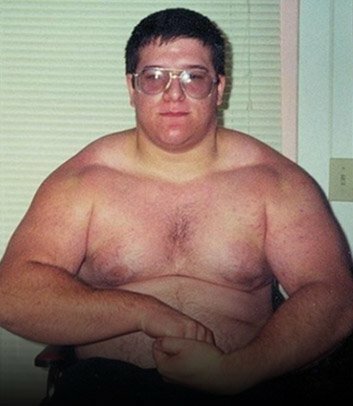 Bench pressing boosted my confidence. It was like a snowball effect. My goal for the disabled community is to open a chain of non-profit gyms to constantly fund my non-profit: Wheelchair Athletics Foundation. When you first started lifting weights again, what kept you motivated? I didn't need motivation, because the thought of being stronger than everybody else kept me self motivated. My first high school powerlifting competition after my accident was December 1999. The school record for my weight class was 275 pounds and the last competitor in my weight class max was 265 pounds. My warm-ups started at 275 pounds and I pushed up 350 pounds that day, breaking the school record by 75 pounds. That was a turning point in my life. I finally found something I was good at, after thinking I had lost everything. 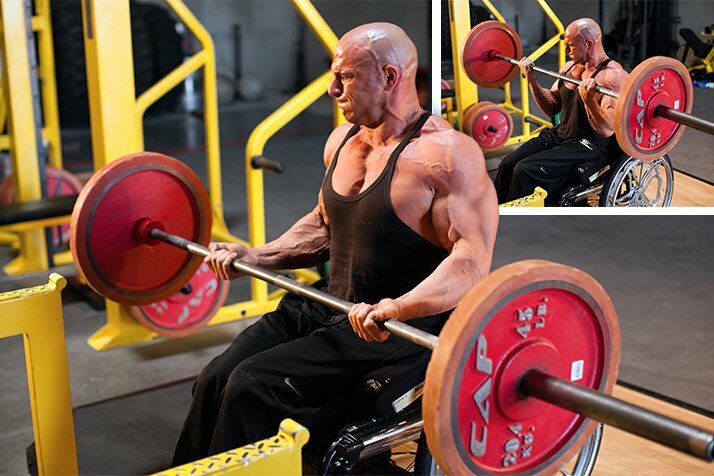 You have inspired a generation of wheelchair bodybuilders. What does that mean to you and your future? It truly is an honor to be looked upon so highly by so many people. I love helping others be the best they can be. When I got involved with Wheelchair Bodybuilding back in the fall of 2005, the sport was largely unknown. 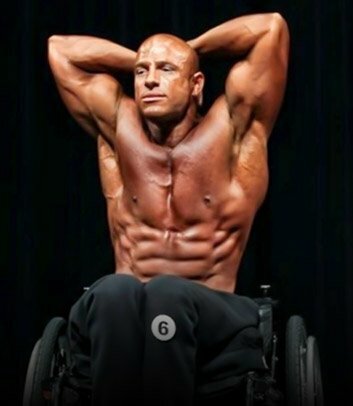 After my first show in March 2006, I wanted the world to know about the sport of Wheelchair Bodybuilding. That's been my mission ever since. I get out there and tell my story to inspire, to motivate, to impact lives. Knowing what you know now about how you've affected the world through your accident, would you change it if you could? No, I would not change it. Many people may think I am not being truthful, but the way I see it, I believe I am in the wheelchair for a reason. God had a different path for my life and he chose me to go through what I have for a reason. The man I have become has affected so many people's lives and they have affected others. It is like tossing a stone into the water and starting a ripple. The day of my accident I was given a gift—a gift of a second chance at life. Instead of wishing things could be different, I am grateful to be given another chance and I will live my life. After going through everything I have gone through, I know firsthand how precious life is and how quickly your life can change. It doesn't matter if my glass is half-empty or half-full; I am just grateful I have a glass. It truly is an honor to be looked upon so highly by so many people. You lost the use of your legs, then reclaimed at least some of your former capability. What would you say to someone in a similar starting position? Do not lose hope or lose faith. I tell newcomers not to let a fear of what others think hold you back. While you heal, you will go through many emotions and put on a face in public and it is OK to break down and cry when you are alone. At first you will not understand or get your answer to the question, "Why?" You have to deal with the situation you're in. One of two things will happen: You will become depressed, hate your life, and hide yourself from the world; or you can deal with the hand you have been given, rise to the challenge, and overcome your situation. Regardless of your situation, time will heal you mentally and physically. No matter what someone tells you, you will resist and that is just normal. Take it from someone who has been in the wheelchair for more than 14 years. No matter how depressed you become or how much you cry, the situation will not get better unless you take action to make it better. It is a choice, choose wisely. What else can you accomplish? 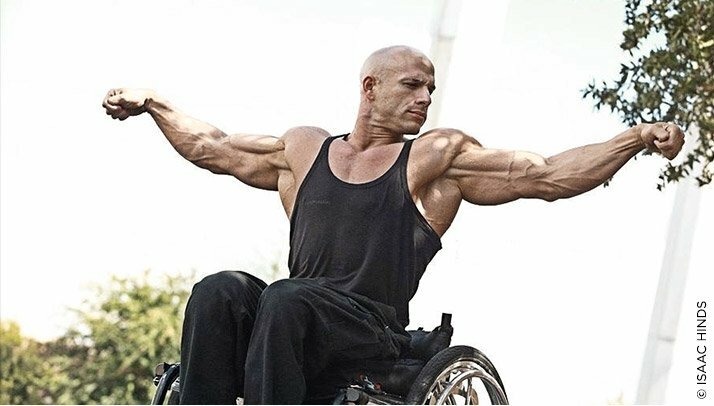 I have multiple things I want to achieve for the sport of Wheelchair Bodybuilding, the disabled community, and for myself, but they all work hand in hand. My goal for Wheelchair Bodybuilding is to have the IFBB Pro Wheelchair Division added to the Arnold Classic and Olympia. Wheelchair Bodybuilding is the only Professional Disabled Sport in the world, and at the 2011 IFBB Houston Pro, it was the first time in history of the world that a professional disabled sport was on the same stage as a non-disabled sport. My goal for the disabled community is to open a chain of non-profit gyms to constantly fund my non-profit: Wheelchair Athletics Foundation. This will provide a steady stream of funds to keep the gym running and support the cause. As for my own goals, I see myself as the next Tony Robbins. To me, I will achieve my goals. The question isn't if it will happen, but when will it happen. The answer? It's only a matter of time. Movie: "Perspective: The Nick Scott Story"
DVD: "Training Series Volume One: Unleash the Beast"